Well, that’s one word, which can change the entire perspective.
. Prom Limo just does that. It is a Luxury Travel Service provider for any event. 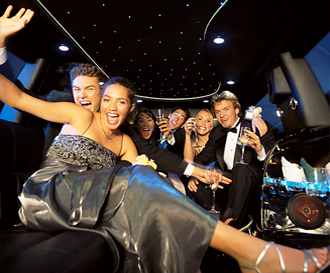 So, if you wish to arrange for an exclusive drive to a Bachelorette party, a special night out, may be a sightseeing, a prom, a birthday or a wedding anniversary, you have Prom Limo. Most preferred and most recommended! Based in Westchester County, New York - the Limo services are available for all in New Jersey, Connecticut and around NYC. Anyone who wishes to grab that one last opportunity to stand out, We are just a call away! Just a note to say thank you so very much for the fabulous time my nephew had at his prom, especially with the Limo Bus. All 22 of them said that the party bus was better than the actual prom. Imagine that? They loved their driver and just can’t seem to stop talking about it. They are all looking forward to doing it again next year! Thank you so much for your outstanding service! You exceeded our expectations! We will highly recommend your company! Thank you so much for the excellent limo service you provided for our 14 students attending SHHS Prom at the Hyatt Regency in Long Beach. The kids had a GREAT time & really felt like they were riding in style! They enjoyed having beverages & snacks on board and, of course, liked the helium balloons and the fun that goes with that. Copyright © 2016 Prom Limo Rentals. All Rights Reserved.